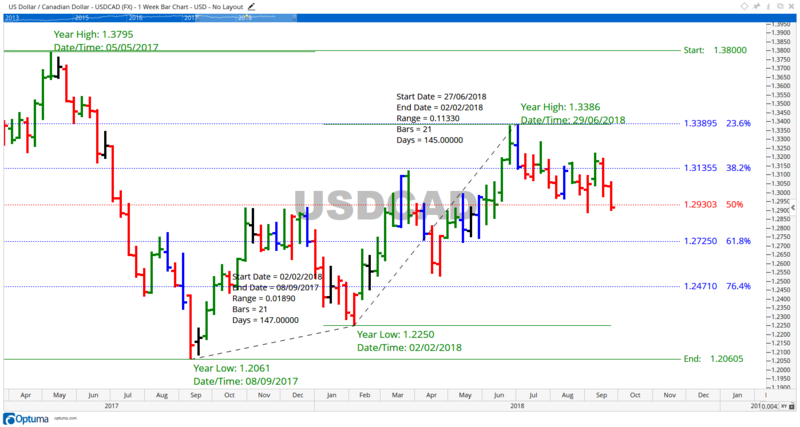 This week the USDCAD chart is reviewed in the Weekly time frame, doing this is a must if you wish to find the major hot points on any chart. Notice I have placed the Fibonacci tool from the high early May 2017 to the next major low early September 2017 and have now revealed the Fibonacci support and resistance levels. Unsurprisingly, the levels have created some distinct and very profitable returns. Notice the 50% level or half way point created major resistance between October and December 2017. I admit this is not a Fibonacci level but in any case it is just too powerful and important to ignore. Next look at the top end June 2018 which shows very clear resistance on the 23.6% level at 1.3386. I also have placed the Yearly high and low marker from Optuma on the chart. From this significant low Feb 2, 2018, to the next major top June 29 is again 147 calendar days or the 144 factor AND it is at a price resistance level. Here we must zoom into the daily chart and look for signals of reversals. In todays report we have seen Time and Price from the Fibonacci series create tradeable reversal points, it is up to us to find these areas and make the most of them when they appear. You can right click on the chart and download it for a better view.